Andromeda Galaxy. It’s one of our closest neighbor galaxies, the closest full size spiral galaxy such as our own, the Milky Way. It lies about 2 million light years away within our local group, which also includes the Triangulum galaxy, as well as a large collection of dwarf and irregular galaxies. Our closest two neighbors are the Magellanic Clouds, Large and Small, which lie less than half a million light years away off the rim of the Milky Way in our southern skies. Another large neighboring body is Omega Centauri, a globular cluster that closely orbits the Milky Way so massive with so many that it is now actually considered a small galaxy in it’s own right. 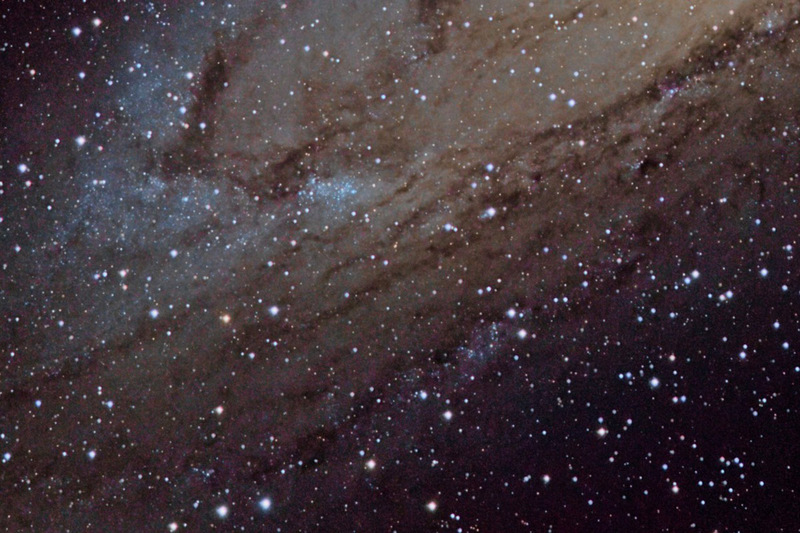 Andromeda Galaxy exhibits many of the same traits as our own galaxy. Like the Milky Way, it has close satellites and neighbors of it’s own. 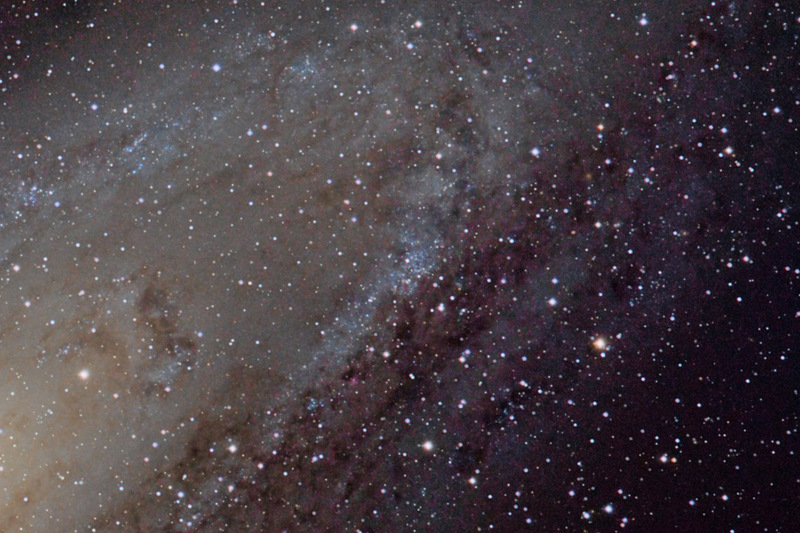 The catalog classification of Andromeda Galaxy is M31, or the 31st messier object. Messier objects are over 100 objects in space first cataloged by Charles Messier in 1771, only a few years before the founding of America. The 32nd messier object is a giant globular cluster that hangs just over the Andromedan galactic disc. M32 in the image I’ve shared here is the slightly yellowish blob just to the upper left of the galaxy’s core, and is probably something very akin to our Omega Centauri. It is very likely, in it’s own right, a very small dwarf galaxy. Similarly, M110, the last object in Messier’s catalog, is a larger dwarf elliptical galaxy in close proximity to Andromeda Galaxy. M110 was not originally an object Messier himself added to his catalog, although he depicted it in his drawings of M31 and M32. The object was much later (in the 1900’s) added to the Messier catalog as they were officially identified by Messier. M110 seems to be very similar to our Magellanic Clouds…larger dwarf galaxies in close proximity. One must wonder…if an alien living on a planet in a star system in Andromeda observed the Milky Way…would it to an Andromedan much like Andromeda does to us? Reblogged this on September's Return. This kind of photography is just so much fun, so scientific, so beautiful!! No fault in those stars!! Thank you, Judy. 🙂 I’m glad you like them. Hi great article and photos. Yes the loacl cluster is a very interesting place we have lots still to learn. Aye, very interesting place indeed. It’s surprising how many other galaxies are within a few million light years. Nice post you got there, really enjoyed andromeda’s photos! Best wishes for you blog! Visit mine, maybe you’ll enjoy as I enjoyed yours! https://thebeautyofspace.wordpress.com/ Cheers!